Children's feet need room to grow, and small shoes with hard soles can pinch and obstruct them, especially when they make their first attempts to crawl and walk. This is not good for the natural grip which the sole of a child's foot needs to acquire. During this period soft, flexible baby slippers made entirely of leather are a much better choice because they give children the feeling that they are walking around barefoot. Being a natural material, it breathes and by doing so keeps little feet cool in the summer and nice and warm in winter. Boumy makes leather baby shoes designed with no laces. The convenient elastic ankle fastening means that shoes can be pulled on quickly and easily. Once they are on, they do not slip off on their own. The rough leather finish underneath also has an anti-slip effect. 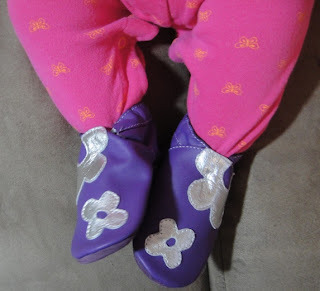 I chose the gorgeous pair of Boumy baby shoes pictured above in the Flower Power Purple design. I picked a size that's still too big for Tzipora, but I figure she'll grow into them right around the time she'll begin pulling up to a stand. 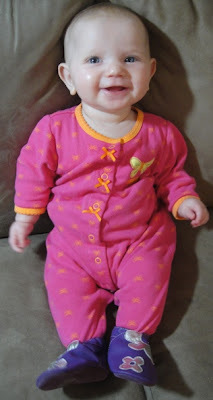 Until then, I don't really think she needs shoes since I mainly dress her in sleepers (as you can see above). The slippers I bought are not only nice looking, but they are very well made. The elastic is stretchy but holds her ankle tightly even though the shoe is still large on her. The leather feels thick and sturdy, and I can tell that the soles will be non-slip once Tzipora starts cruising. Boumy has so many different designs to choose from that it was difficult to pick my favorite. The shoes are all made with the special elastic ankle and non-skid soles. I used to be a barefoot-only mama, but I will feel good about letting Tzipora wear these as she starts to stand up. I think it might even be better than letting her go barefoot, since our floors are pretty dirty with the twins tracking things everywhere! Cost: You can buy the Flower Power Purple Boumy shoes for $32 + shipping. Until July 31st, you can take 20% off your total purchase by using coupon code MAB072011! Limit of one redemption per customer. Overall: We give Boumy Shoes a 9/10! This is a picture of Tzipora checking out her new shoes. I think she likes them! We were sent a pair of Flower Power Purple Boumy shoes free of charge for the sole purpose of this review; no other compensation was received. All opinions expressed are my own. This review was provided through MamaBuzz. The product was provided by Boumy Shoes for this review. (depending on the person and the gender), so teenagers who wear high heels are doing permanent damage to the growth and formation of their bones! I'm so glad that soft, minimalist shoes are coming into fashion. so nice Foot wear and some children took it as fun to wear them again and gain.